Quickly and effectively removes unwanted facial hair. Easy to use — just apply and peel away! Warms in seconds in the microwave. Smooth results last up to 8 weeks. Mistake-proof. Helps reduce the appearance of hair regrowth. 3 Easy to Use Brow Guides, Post-Treatment Extrasoothe Lotion with 5% Benzocaine and Complete Instructions in English and Spanish. Dermatologist Tested and Salon Tested. Apply wax in the same direction as hair growth. Apply wax in a thin layer. Remove wax in the opposite direction of hair growth when it is soft and pliable. 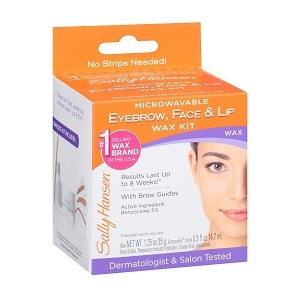 MICROWAVABLE EYEBROW, FACE AND LIP WAX: GLYCERYL ROSINATE, CERA ALBA/BEESWAX/CIRE D'ABEILLE, CALCIUM CARBONATE, MAGNESIUM CARBONATE, PARAFFINUM LIQUIDUM/MINERAL OIL/HUILE MINERALE, SORBITOL, CANOLA OIL, COCOS NUCIFERA (COCONUT) OIL, PRUNUS ARMENIACA (APRICOT) KERNEL OIL, CHAMOMILLA RECUTITA (MATRICARIA) FLOWER EXTRACT, ALOE BARBADENSIS LEAF EXTRACT, D&C RED NO. 17 (CI 26100).EXTRASOOTHE SKIN RELIEF LOTION: ACTIVE INGREDIENT: BENZOCAINE 5% …………………….Purpose- Topical Analgesic.INACTIVE INGREDIENTS: AQUA/WATER/EAU, ETHYLHEXYL PALMITATE, PARAFFINUM LIQUIDUM/MINERAL OIL/HUILE MINERALE, PROPYLENE GLYCOL,GLYCERYL STEARATE, CETYL ALCOHOL, PALMITIC ACID, TRIETHANOLAMINE, STEARIC ACID, IMIDAZOLIDINYL UREA, PARFUM/FRAGRANCE,PEG-100 STEARATE, CARBOMER, METHYLPARABEN, TOCOPHERYL ACETATE, LANOLIN ALCOHOL, LINALOOL, BENZYL BENZOATE,ALOE BARBADENSIS LEAF EXTRACT, ALCOHOL, LIMONENE, GERANIOL, CITRONELLOL, MYRISTIC ACID, EUGENOL, CITRAL, SOLUBLE COLLAGEN, PROPYLPARABEN, CITRIC ACID, BENZOIC ACID, TOCOPHEROL, BHT.